Make a cool dessert your kids will love with this awesome Skateboard Cake. 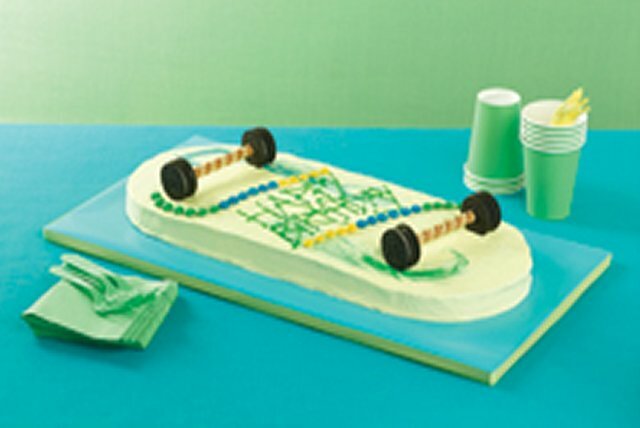 The 20 minute prep time of this Skateboard Cake makes it anything but a grind. Prepare cake batter as directed on package; pour into one 9-inch round cake pan and one 13x9-inch baking pan, making sure that the level of batter in each pan is the same. Bake as directed on package for each pan size. Cool in pans 5 min. ; remove to wire racks. Cool completely. Spread tops of 4 of the OREO Cookies with some of the icing; top each with second OREO to resemble a skateboard wheel. (You will have a total of four "wheels.") Attach one set of cookie wheels to each end of the wafer cookies with the remaining icing; set aside. Place rectangular cake on large board or platter. Cut round cake crosswise in half; position one half at each short side of rectangular cake, with cut side of round cake against side of larger cake as shown in diagram to resemble a skateboard. Tint whipped topping with food coloring to desired color; spread onto tops and sides of cakes. Sprinkle a few drops of food coloring randomly over top of cake; carefully cut through food coloring with palette knife or spatula for marble effect. Decorate with chocolate pieces as desired. Use gel to write desired message on cake. Store in refrigerator. Arrange wheels on top of cake just before serving.